Earn 139 - 440 points upon purchasing this product. Use 1390 - 4395 points to purchase this product! Spirulina is a nutrient rich blue-green algae packed with proteins, vitamins and minerals. This organic powder contains important amino acids including lysine, cysteine, methionine, phenylalanine and threonine. It has a high iron content (more than spinach) and contains more beta-carotene than carrots. 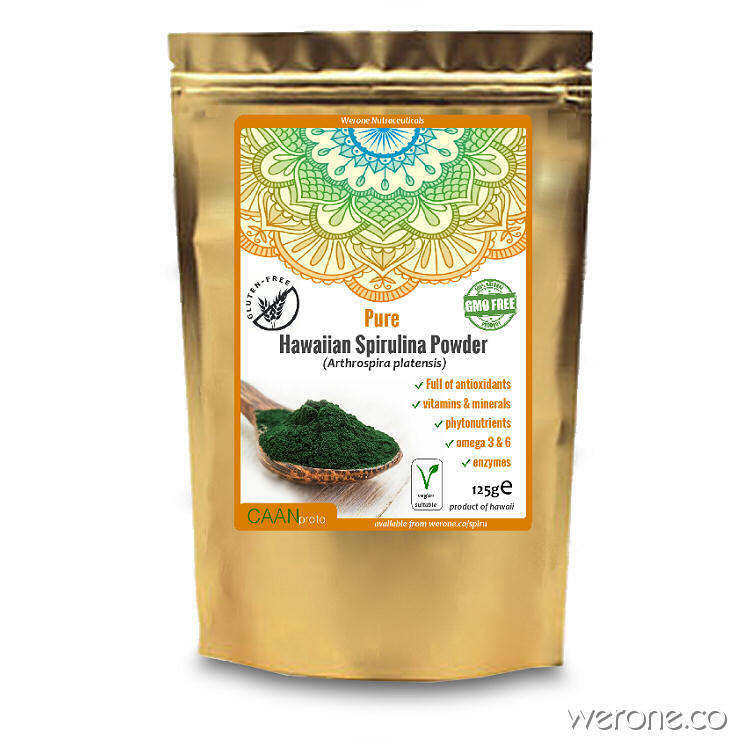 Hawaiian Spirulina is a specially grown strain of the edible microalgae (Arthrospira platensis). It is cultured in shallow, open ponds (approximately 20cm deep) in Hawaii, adjacent to the Pacific Ocean. A combination of fresh water and supplemental deep ocean water is used to fill the ponds. Paddle wheels agitate the water, ensuring even exposure of the algae to the sun for optimal growth and nutritional value. As a food Spirulina has been consumed in various forms over centuries in different parts of the world. Its protein constituent is in an easily digested form. It also contains minerals, vitamins, essential fatty acids and antioxidants that are not available to humans from any single food of vegetable or animal source known so far. Spirulina is not a reliable source of vitamin B12, whilst it is rich in it, Algae contains B-12 analogues (false B-12) that can provide false results in B12 testing. The only reliable vegan sources of B12 are foods fortified with B12 (including some plant milks, some soy products, shilajit (fulvic acid) and some breakfast cereals) and B12 supplements such as this liquid form which includes both Methycobalamin and Adenosylcobalamin. . Vitamin B12, whether in supplements, fortified foods, or animal products, comes from micro-organisms. Nutritional Information Typical Values per 00g – Energy 309 kcal, 1306 KJ, Protein 56.6g, Fat 4.1g, of which saturates 1.3g, of which mono-saturates 1.5g, of which poly-unsaturates 1.4g, Carbohydrate 11.7g – of which sugars 3.7g, Fibre 16.4g, Sodium 0.3g, Thiamin 100% RDA* 1.4 mg, Riboflavin 431% RDA* 6.9 mg, Vitamin E 130% RDA* 13 mg, Niacin 32% RDA* 5.9 mg, Zinc 22% RDA* 3.3 mg, Iron 590% RDA* 82.7 mg, Chlorophyll 1179 mg, Lineolic Acid 940 mg, Phycocyanin 12800 mg, *Recommended Daily Allowance. This spirulina is the best we can take for health. feels good and very concentrated powder ! I bought this as I couldn’t get hold of my usual Nutrex brand. Hard to tell how different it is – it doesn’t smell as strong, but looks fine.